For other uses, see The Miracle Worker (disambiguation). 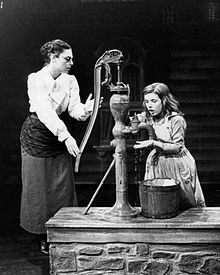 Photo of Anne Bancroft as Annie Sullivan and Patty Duke as Helen Keller in the broadway play The Miracle Worker: In this scene, Miss Sullivan tries to teach Helen the meaning of "water". The title originates in Mark Twain's description of Sullivan as a "miracle worker". The famed American humorist and author was an admirer of both women, and although his own personal finances were problematic, he helped arrange the funding of Keller's Radcliffe College education by his friend, financier and industrialist Henry Huttleston Rogers. Wikimedia Commons has media related to The Miracle Worker.